I bought an extra set of these gauge cluster chrome rings and won't be needing them. 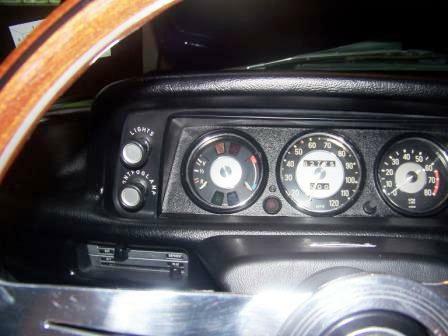 They fit directly into the Faux Wood Gauge cluster used on the later 2002's and can be secured with adhesive. The pic shows them installed in my painted gauge cluster. $30 shipped. I got an email from the manufacturer of the rings. They have 3 sets in stock and can make more. The plant is currently down for maintenance but more will be available. They can be ordered from the following link. Mine arrived from the UK within a week. I'm getting several inquiries on the possibility of obtaining more of these. I've contacted the supplier in the UK to see if they'll do another run. I had to send my gauge face to them to have the original set fitted but they should be able to produce more without an issue. I'll post their contact info once I get confirmation so you can place your orders directly. I've attached a pic of what they look like in the stock faux wood cluster. There's also a German company that sells these occasionally on Ebay U.S. and much more often on Ebay Germany. I had these on my late cluster, but they also fit perfectly on my silver dollar cluster.